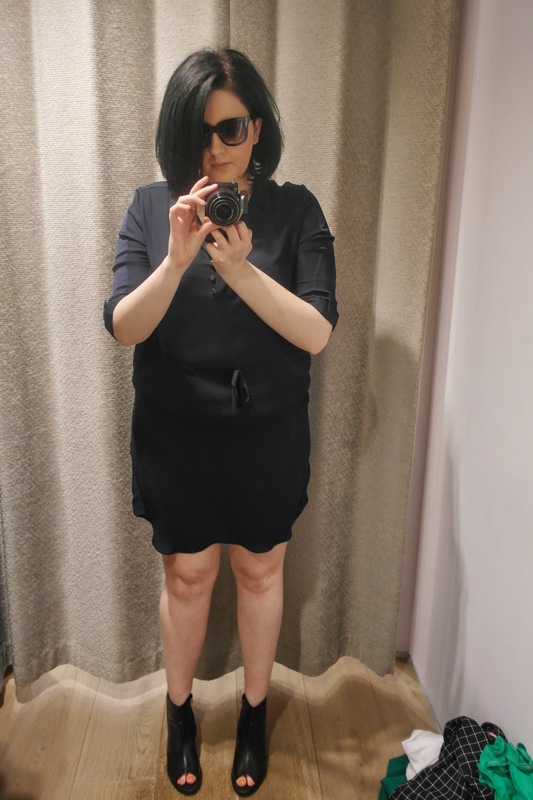 Last week, I posted about the fabulous clothes in Warehouse that are perfect for city breaks and upcoming holidays. Warehouse were kind enough to let me pick some items to wear on my little break to Amsterdam. I knew the weather would be much the same as home- warmish with a chance of rain! Layers were essential so I opted for a peasant style shirt, £35 that seemed very traditionally Dutch with the pattern on it. This has sleeves to the elbow which is great for the weather and I loved the tie up detail on the chest. 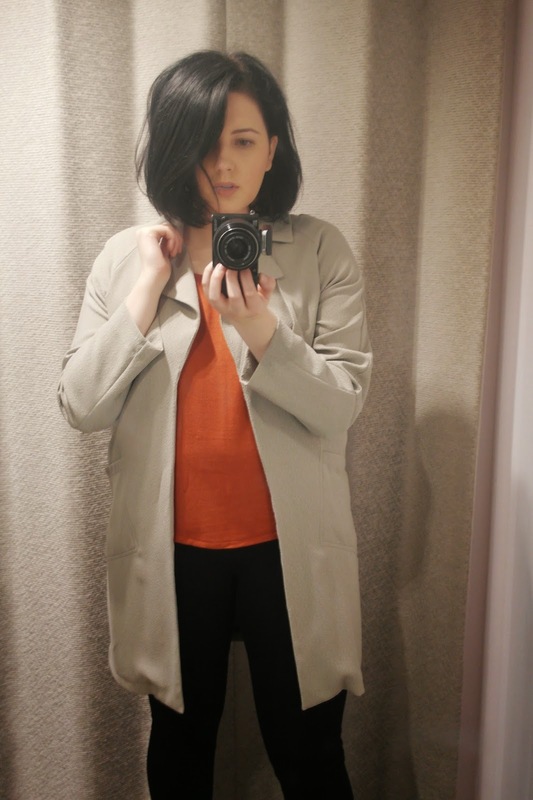 I layered The Duster Coat, £60 on top. This was the perfect "throw on" number and it kept me warm but not over-heated. I would highly recommend a duster jacket for this time of year- I know I'm going to get so much wear out of mine. Dark colours are also great for a city break- often you are on the go all day so any marks or spills won't be noticeable. I also wore the Girlfriend jeans, £40. I find it hard to find jeans to fit my big hips and long legs but these are perfect! They are so comfortable and I know they will look great with heels/sandals for night time. Finally, I opted to wear the Sporty Gladiator, £38 with my outfit. These are the MOST COMFORTABLE sandals ever. If you have narrow feet and small ankles, you need to invest. I walked the length of Amsterdam in these with no blisters or sore feet. I could not encourage you to buy these more if you are going on holiday- plus they look super chic with most outfits. I had never been to Amsterdam before so when KLM offered me the chance to visit and try out their new Belfast City to Schiphol route, I was over-joyed. The flight times are great, the plane is lovely and the journey only takes 70 minutes. We flew business class which was a real treat- the seats are much larger and a full meal and drinks are served. It's as fast as a trip to London and it offers a cultural scene that I've never really felt before. I am lucky that I've visited lots of lovely places in my life but I felt a different vibe in Amsterdam. It's a really easy going, no stress holiday destination. Although I was only there for a day, the city is compact enough that a long weekend would be perfect to see all of the sights. We stayed at the Citizen M Hotel at Schiphol airport. The train station in the airport meant it was only a train away into the city centre. The hotel was really cool- the rooms are small but feature a king-size bed and iPad operated media and lights. The room doesn't have a separate bathroom but instead has a little pod for the toilet and shower. It does feel a bit strange at first but you get used to it. It's great for people travelling alone but I imagine if you are with a friend, it might be a bit odd! However, by myself it was great fun and the huge bed was very comfortable and much needed after lots of running about. This would be a particularly great hotel if you were stopping over in Schipol for a flight further afield. The five minute walk to the airport made it much easier to get up the next day! On our short trip we visited the Van Gogh Museum and went on a canal tour. 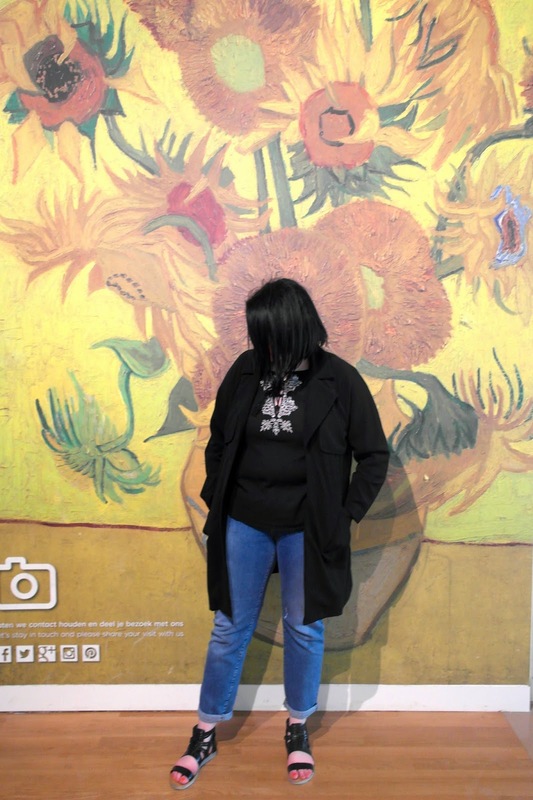 The Van Gogh museum was very cool. The building is really modern and we used a multimedia tour (a bit like an iPod) to work around the paintings at our leisure. We had a short time here but you could really spend all day looking around. 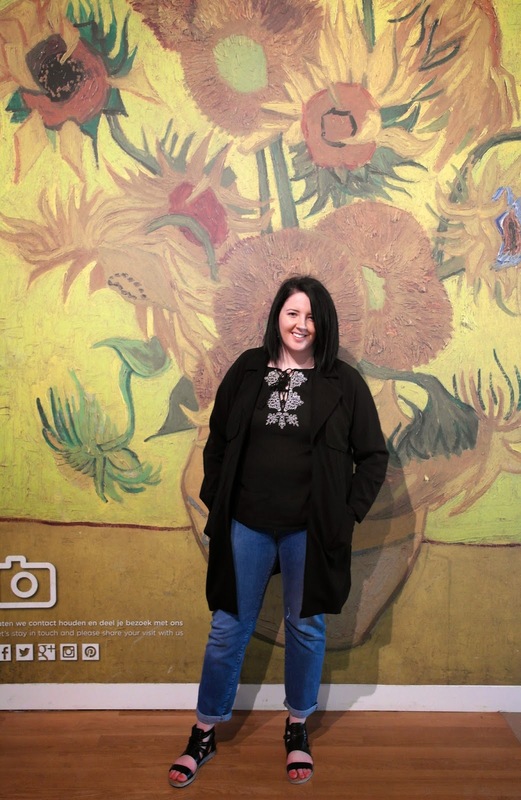 I loved getting to see The Sunflowers in real life (much bigger than imagined!) but I feel in love with the painting Almond Blossom. It looked so modern and like something that was almost digitally printed. Following the tour of the museum, we walked the short distance to go on a canal tour. This really was the best way to see Amsterdam. The hour and half tour explained all of the history of the city, passing famous landmarks including the Anne Frank house, Nemo Museum and numerous concert halls. This was really enjoyable and I loved standing out at the back deck of the boat to take pictures. In the evening we dined in Brassie Harkema, close to Dam Square. This was enjoyable and a lovely building to sit in- spacious and airy. At night, we all explored Amsterdam. Sadly it was too late to shop but I did spy some gorgeous boutiques and brands that aren't often seen here in Northern Ireland. There were also many cheese shops that kept me laughing- the Dutch do really love their food! We ended the night with a Nutella waffle- waffles and crepes are served almost on every street which is great if you have a sweet tooth like me! On my way back through Schipol, I stopped off at my favourite Victoria's Secret to pick up some bits and pieces. There were lots of great stores in the airport including H&M and Mexx. I could have spent hours buying stuff! Overall, it was a lovely trip and the new Belfast City to Schipol route offers not only the opportunity for a great city break but the opportunity to travel further afield when used as a connection point. Thank you so much KLM for a lovely trip. Warehouse is a shop I've loved for years. And now they have a stunning store, it's easier than ever to get your hands on their new season drops. The store itself is small but packed with goodies. The fitting rooms are fantastic- big, spacious and room for your mum/boyfriend/best friend to sit on the comfy sofas whilst you spend hours trying on the latest trends. Warehouse is a very diverse shop- I feel my mum could wear many of the items I've picked out too. I am going on an exciting trip in a few days. It's a very quick city break. City break style to me is laid back, easy and involves clothes that don't crease easily! I feel like the staple of city break style is a good pair of jeans. I have loved Warehouse jeans since I was a teenager. They are great for my long legs, fit my big bum and don't stretch when they are washed. I loved the Girlfriend pair but the classic black Powerhold Skinny were fantastic on. I find their jeans very slimming- they aren't too low on the waist and have great fabric. They also go from a size 6-18 which is great to see from a hughstreet retailer. If jeans aren't your thing, they offer a huge range of trousers. I loved the wide leg variety, many of which come with a matching jacket or waist-coat if you want to tap into the co-ord trend. 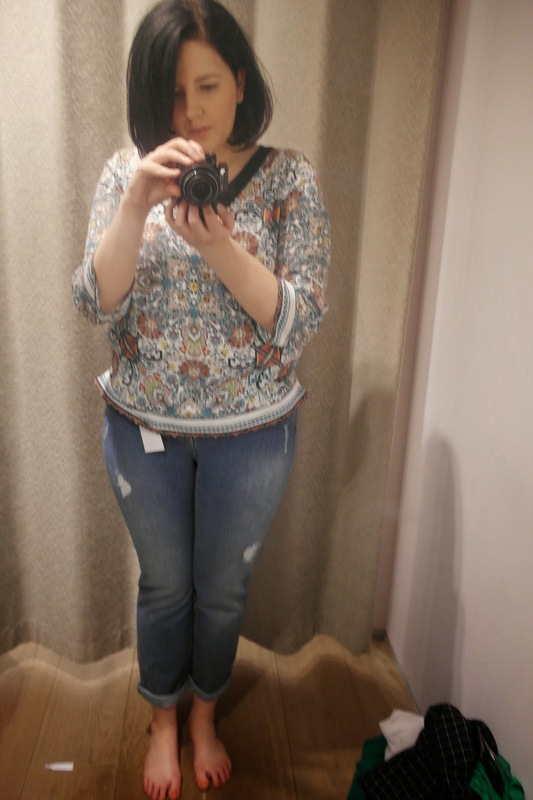 As you can see, I tried on lots of different tops but I was particularly taken by the gypsy top trend. I thought these would be very unflattering but rather the opposite. I am quite self conscious of my chest and instead of emphasising it, the top covered and minimised the area. I think hen packing for a city break, a few great tops that will take you from day to night plus fab jeans are all you need. In terms of of jackets, I loved The Duster Coat. It was light but still gave some warm- perfect for this time of year at home and away! Comfy shoes are always needed on a city break and the Sporty Gladiator sandals are the comfiest summer shoe ever. They have a trainer sole so they are squishy and like a hug for you feet- essential for all the walking required around your city of choice. I also loved the Peep Toe Ankle Boot as a more dressy alternative. These have a block heel and again, are very comfortable. Warehouse also have lots of dress shirt dresses in at the minute. Again, these are fantastic for a city break as they can be worn over jeans for day and with bare legs for night time. As for bags, I fell in love with the mini duffle bag that was still big enough for your phone, camera and phone whilst touring about your favourite city. What do you think of the city style pieces I've picked out? Let me know below or by tweeting me @GemmaLEBond. Thanks Warehouse Victoria Square for having me into the store! Sometimes I only have time to wash my door and run out the door. I seem to spend a lot of time doing my makeup on the go at the minute (foundation, blusher, mascara-done!) so I get great joy when I get to wash my face in the morning and again at night. I have been using Tropic Smoothing Cleanser, £15* for a few weeks in the morning and again at night. I honestly didn't think I was going to like it. It seemed very similar to Liz Earle's Cleanse and Polish which I used to like but not love. Cleanse and Polish never fully removed my eye makeup and I always had to go back in with an oil. However, I was so wrong. This product is fantastic- removes all makeup (including tough eye makeup) in a gentle manner and then is rinsed with warm water and the bamboo cloth provided. It feels thicker than a lotion but less than a balm. Two pumps is enough to cover my whole face and the cloth lightly exfoliates the skin. This has been an absolute pleasure to use and reminds me a lot of my favourite Yon-Ka that retails for more than twice the price of the Tropic Smoothing Cleanser. I would highly recommend this for all skin types and best of all, it's all natural! Previously when I have used all natural products, they have irritated my sensitive skin but this has made my skin feel clean, nourished and I feel like my skin texture generally looks a bit better. I follow my cleanser with Nuxe Creme Fraiche de Beaute Light* which moisturises and mattifies and I also stick a bit of Bliss Fabulips Balm on my lips so they don't dry out. This makes for a perfect base for makeup but also, a hydrated and clean face for bed. I absolutely love the Tropic Smoothing Cleanser and for £15, I think it's great value for money. Many thanks to Gillian & Nikki for my cleanser!